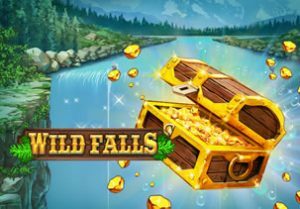 Go prospecting for a gold rush in Wild Falls, a 5 reel, 20 payline slot game from Play ’N Go. Look out here for respins with sticky wilds, free spins moving wilds and a gold rush bonus where multipliers can combine to boost payouts by up to 125x. There’s also the Super River of Gold Bonus where awards of up to 10,000 times your stake are possible. Play this volatile game on all devices from between 20p and £100 per spin. With the Yukon River and a mighty waterfall in the background, you’ll see stone style A to 10 symbols plus a selection of higher value mining equipment spinning around the reels. They include lamps, picks and shovels and a pan full of gold. The best of the standard symbols is the sack of golden nuggets which pays 2.5, 12.5 or 25 times your stake if you land 3, 4 or 5 on a payline. The treasure chest is both the wild and scatter. These can flow down the river and waterfall and drop onto the middle 3 reels only. They’re also central to much of the best action on offer in Wild Falls. Rapid Respins feature – this is triggered whenever a treasure chest hits. After a payout is made, the treasure chest locks in place and the reels spin again. If another chest lands on the respin, the process is repeated. If no new chest hits, the respins end. Land 3 treasure chests and you’ll trigger the River of Gold Free Spins feature. River of Gold Free Spins feature - rather than chests dropping off the reels after a free spin or respin, they move down 1 position on the reels. New wilds can land during this feature too, just like in the base game. The free spins keep on coming as long as there’s a treasure chest wild on the reels. Gold Rush feature - this triggers at random and turns any treasure chests into gold treasure chests for that spin and any respins that follow. These golden treasure chests can come with 2x, 3x and 5x multiplier attached. With more than 1 treasure chest in play, the multipliers are combined. A maximum 3 of the 5x multiplier will deliver a massive 125x boost. Super River of Gold Free Spins feature - this is awarded when the Gold Rush feature triggers during the River of Gold Free Spins feature. All chests are gold and contain hidden multipliers – this can lead to payouts of 10,000 times your total stake! Wild Falls is a rather unusual game. The gameplay certainly offers something a little different. It’s rather good though - and highly volatile too. Get lucky with those treasure chests and this waterfall could deliver a torrent of coins. If you like mining themed slots, Blueprint Gaming’s Diamond Mine (MegaWays) is worth digging into.